Whew! 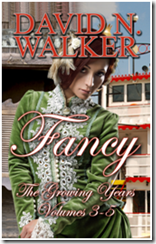 For over a year now, I’ve spent a good part of most days working on Fancy, my novella series. Actually, I’ve worked on the story off and on for nearly twenty years. You know, writing it, tossing it aside, revising it, tossing it aside again, etc. Have you ever had a love-hate relationship with a favorite project? I’ve loved this story for twenty years, but I’ve gotten so frustrated with it at times I hated it and wished I’d never heard of it. I belonged to three different writers’ groups that helped me work on it, but the conclusion usually ended up being it was not a workable project. Finally, a year and a half or so ago, my friend Jillian Dodd suggested that I make it a series of novellas rather than a novel. Bingo. A light came on. Two big problems had always been stumbling blocks to the novel. It covered too much time and geography, and no single antagonist lasted (or could last) throughout the story. Breaking it into novellas allowed each volume to deal with a more limited time and location as well as with a single antagonist. Jill also told me how well she was doing with self-publishing. 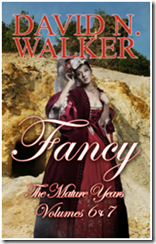 She told me so many writers were self-publishing now that the old stigma was gone. Once I made the decision to rewrite it as a novella series and to self-publish them instead of waiting to see how many agents could sit on it or whatever they do with the manuscripts people send them, I began to get excited about it again. I began to believe this was something I could really do—and I’ll confess I’d lost confidence in my ability to write anything until Jill started talking to me. 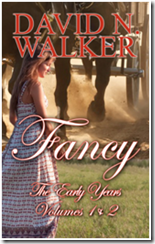 I finished editing and tightening Fancy: The Final Chapter yesterday. Today I submitted it for editing by others. 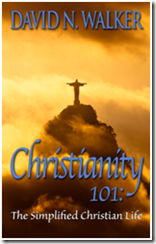 It won’t actually be published until September, but I’m through with the writing process. Hence the big Whew! While I’m waiting for the edits, I’m in the process of resizing the paperbacks of the first five volumes from 6×9 to 5×8. I don’t know why I started with the larger size, but it makes the books so thin they look a bit strange. Jill suggested this change to me a few weeks ago, and more recently my friend Karlene Petitt made a similar suggestion. Then I looked at a volume 5 next to a volume 6 and saw for myself how much difference that sizing change could make. I’m also trying to figure out how to comply with the changes Smashwords wants me to make so I can get all the books out through them and KOBO and iTunes. I don’t know why I have so much trouble understanding the English language, but for some reason, when it’s anything the least bit technical my brain freezes. While all this is going on, I’m entertaining thoughts about my next project. I think it will probably be a three-volume novella series about a young girl who sees her mother killed by Yankee raiders on their Mississippi farm during the civil war. Haven’t settled on this for sure, but that’s what I’m thinking. What do you do when you finish a long-term project like a novel or series of novellas? Scream? Jump up and down with joy? Sleep for a week? Readers would love to know. 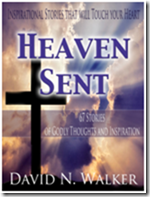 This entry was posted in Freestyle Friday and tagged Advice, Authorship, David N. Walker Christian Author, David N. Walker Historical Fiction Author, Fancy Series, Heaven Sent, iTunes, Jillian Dodd, Karlene Petitt, KOBO, Life, Life experience, Life lessons, Life truths, Life values, Personal development, Self-help, Smashwords. Bookmark the permalink. Congrats, David. It’s a mammoth achievement, but your perseverance has paid off. I’m not sure how I’d react, but whatever you choose, best of luck with your new project. Thanks, Nigel. It’ll be good to see you when you return to civilization. You’ve persevered, and the fruit of your labor is a captivating tale. Congratulations on writing an interesting and colorful novel. Keep your creative juices flowing. Thanks, Sharon. It wouldn’t have been possible without you and Lara. Thanks, Rhonda. It’s a combination feeling of pride and relief. Thanks, Jane. Family reassurance always helps. Gee, if I had just finished a huge project such as you have with “Fancy,” I’d celebrate big time and tell everyone I knew. Oh, is that what you are doing? Congratulations Bro …. it’s a really good series. I look forward to the final novella. Thanks, sis. I always appreciate your support.